Tree Peonies grow best in neutral, fertile, well-drained soil. Clay, chalk and sandy soils are OK as long as the plants don’t become too dry or wet. Water-logged and very dry sites should be avoided. Thoroughly prepare the site and incorporate some well rotted organic material. Tree peonies are extremely hardy but new growth can be damaged by spring frosts. To counter this, choose a fairly open site but, if possible, one that has shelter from strong winds and early morning sunshine. Avoid deep shade or roots of large trees. 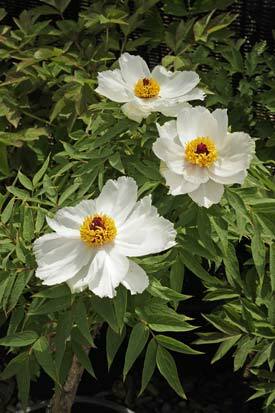 These pot-grown Tree Peonies should be planted slightly deeper than soil level in the pot. This is particular important for the grafted varieties when the graft must be covered by 8-10 cm of soil to encourage the graft to form its own roots and shoots. Should suckers appear from the herbaceous nursery-stock (the foliage is different from the grafted tree peony) remove the sucker, although note the grafted peony will also produce shoots from the base. 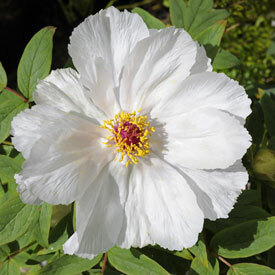 Occasionally a newly planted tree peony will require a 'settling in 'period - not making much top growth or producing any flowers in its first season, whilst the roots become established. Providing the foliage looks healthy - be patient. Buds should appear in autumn, followed by vigorous growth in early spring. These plants can be grown-on in large containers for several years or can be planted out all year round, as long as the soil is not frozen or too dry. Pruning should not be necessary, although they can be trimmed back into shape if required and die-back removed in the dormant period.